The annual income an Australian author earns is $12,900. An average full-time worker in Australia earns this much money in eight and a half weeks. Authors generally supplement their income with related work — teaching and editing — and unrelated work — part-time jobs, small businesses, flipping houses. For those earning a nearly-average annual income, only a quarter of it will come from being paid for their artistic work. This number is true for artists across all disciplines. Figures like these should provide a solid disincentive for people thinking about a career in the arts. Yet to varying degrees, this situation has always been true, and there is no culture in the world that is without artists (at least, not for long). The shared understanding is that if you take your art as your means of being in the world — i.e. your art is your job — you accept the financial instability and that your career is a permanent hustle. To run what is effectively a small business presenting your artwork as useful, attractive, and culture-enhancing, there is much, much more to do than simply making your artwork. There are the unpaid promotional activities; fellowship and funding applications; endless networking and unpaid internships galore. In a grim but useful report on the state of the arts in the US, Alexis Clements writes that 'no matter where you fall in the fame or success spectrum, you get to spend about 20 per cent of your time making art'. That's one day per working week. You could go on the dole, which is where many young artists find themselves. But that's not really enough to survive in a major city for long, and can be an inconsistent and demoralising experience. For authors, at least, publishing houses used to present contracted authors with advances large enough to reasonably take some time out from unrelated employment and focus on manuscript development. The past decade has been hard on the publishing industry, and so large advances are now very rare — many advances I know of have been barely enough money to replace a regular income for one month. Arts grants of course exist, but are highly competitive (and subject to political interventions by state and federal governments), and are viewed in Australia as occasional prizes rather than vital income support. Which leaves the university, where many artists now find themselves, in MFA and PhD programs. If they are lucky, they will be granted a three-year scholarship (a tax-free stipend a few hundred dollars a month more than a Centrelink pension) to develop an artistic research project framed by a methodology that is legible to the university. Creative arts researchers compete with STEM researchers for scholarships, and so the competition for funding is stiff. For creative writers, this project usually takes the form of a split thesis comprising of a creative manuscript and a scholarly exegesis responding to or contextualising the creative work. The university is not an ideal environment for all writers — though writers, for obvious reasons, often thrive within it. Rather the university, for many writers, is a material solution to the problem of how to pay rent when your work has no monetary value. But as an institution, is the university capable of meeting the needs artists have to independently create their work, and still somehow find money to live in the world? "When the university is seen as a source of unofficial arts funding, it is a source of arts funding that precludes artists who don't have a record of 'academic achievement' in a tertiary context." In the first place, it is important to note that when the university is seen as a source of unofficial arts funding, it is a source of arts funding that precludes artists who don't have a record of 'academic achievement' in a tertiary context. Many writers are well-positioned for 'academic achievement': they are usually curious and patient people whose primary preoccupations are reading and writing, and these traits give them skills that are often recognised and rewarded at university. But these traits do not automatically translate into academic success: many factors other than latent intellectual potential inform how well students perform. In raw terms, academic achievement is a class issue. And much like the notion of 'excellence', 'merit' is ideological. Therefore, to be in the running for a scholarship, a student must have already had their abilities or potential acknowledged and rewarded within an ideological education system. Australia's education system disadvantages students from poorer family backgrounds, and early disadvantage is known to affect post-school 'outcomes' (meaning class status, capital). Where the money comes from — and whom it is given to — eventually, necessarily informs what kinds of artwork thrives, and which artists are worth the investment. As French writer and scholar Didier Eribon says, 'art, culture and education are, undeniably, part of the mechanisms of differentiation between social classes'. And the institutional frameworks underpinning the production of artwork can lead to pernicious political outcomes. In the early 1950s, the CIA launched a propaganda program which later became known as Operation Mockingbird. In an effort to promote American culture during the Cold War, this operation funded many arts institutions and literary journals (including The Paris Review). 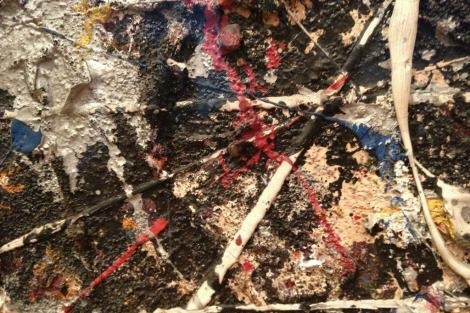 In one case, a major exhibition of American Abstract Expressionist artists was secretly funded by the CIA, and not because Jackson Pollock's paintings effectively conveyed the virtues of a global free market. Operation Mockingbird was not mere — or merely — state-sponsored propaganda; artists such as Pollock, who were unaware of their government's covert support, were often themselves ex-communists who had been barely tolerated in the witch hunts of the McCarthy era. CIA agents were covertly installed in hundreds of fine art, music, film, and publishing institutions, to promote artistic work that was favourable to America's war against communism, and presumably, to suppress the links artists had with radical political activism. Arts institutions, artistic movements, and individual artists, were harnessed by the US government to project the notion that America was sophisticated, culturally rich, and free enough to permit the production of radical — or at least experimental and challenging — art. Soft diplomacy of this kind is not remarkable, nor is it necessarily insidious. But its influence cannot be understated. Operation Mockingbird — as a pernicious example of the entanglement of capital, ideology, and art — enabled the production of certain kinds of artwork. What artwork it suppressed, we will never know. The money — and the ideology regulating its circulation — creates conditions for artwork to be produced. The money creates hierarchies and the money assigns value to artwork. "The mysterious selection process determining which projects are supported by scholarships, and whether or not social equity is a concern of the university, leaves questions about what impact, if any, 'the university' will have on the shape and texture of future Australian literature." American 'literary fiction', for example, was a major beneficiary of covert CIA sponsorship. In 1967, the Iowa Writing Workshop — arguably the most influential MFA program in modern American fiction — started to receive funding from a covert CIA 'foundation'. In return, the workshop's more conservative administrators contributed to developing the movement of American literary fiction: writing that was intellectual but not theoretical; ideas-driven but not political; governed by middle-class concerns but not really about class. Describing this genre, author Jarett Kobek says: 'your characters could have mental breakdowns on hardwood floors but couldn't ever question the complex social structures of labor and exploitation and environmental damage that produce hardwood floors'. This was literature that lionised the cultural values of liberal, bourgeois individualism. One can see the traces of this literary movement in contemporary Australian fiction. But this genre of literary fiction is not the only — or even necessarily the most influential — school of literary writing taught to writing students these days, nor is it the only literary school a postgraduate researcher in creative writing can examine. A student can propose a project on any number of topics: computer-generated poetry, climate fiction, domestic violence narratives, experimental film criticism. Indeed, many such projects find themselves well-resourced and intellectually supported in the rigorous environment of a university. But the mysterious selection process determining which projects are supported by scholarships, and whether or not social equity is or should be a concern of the university, leaves questions about what impact, if any, 'the university' will have on the shape and texture of future Australian literature. Who will be rewarded? And for what kinds of work? With the closure of yet another art school, Lauren Carroll Harris wrote, instead of 'asking "Can art restructure the world?" I should have been asking "How is the world restructuring art?"' Every writer and artist seeking shelter in the rapidly diminishing tertiary humanities departments (for a few years of a small income) should ask themselves the same question. Ellena Savage is an essayist, critic, and editor from Melbourne. A very interesting article, as always, from Ellena. It's disheartening to read how difficult it is for writers, and other artists, to make a living. Writing is a craft, a creation, an endeavour that shows what we are capable of. How important is that! Tertiary humanities departments should be independent of politics and nurture the power of the written word, not fit it into some structured enterprise. Writers should be free to look out their windows or gaze into space without wondering where the next dollar is coming from. A beautiful dream! The reality is that a published writer gets 10% of the earnings that come from his or her work, the bookseller 35% and the publisher 55% out of which comes his costs with the remainder his profit. In the workplace this is called extortion or slave labour. The size of the market of course determines the earnings and the market is often populist driven rather than talent driven. Hence big sales for accounts of sportsmen's and failed politicians' boring lives or the ramblings of confected celebrities, preferably with a little voyeuristic scandal thrown in to boost sales. Unlike the works of the great writers, artists and musicians, much of today's offerings promise little of lasting value, emulating a Guy Fawkes night sky rocket shooting spectacularly skywards to cheers and acclamation only to disappear with a bang in oblivion. Business is business. As you imply Ellena, the name of the game is money not lasting art. The alternative Ellena is that art is done in a vacuum - hardly possible. The challenge for artists is to exercise their agency, their freedom to critique the social context of our lives and at the same time be creative. I am surprised that you haven't spoken of the contribution artists make by their teaching. Having said all this, you are right point out the silencing forces at work in our society. Intriguing, Ellena, and just. It's a pity, but the arts are always busy with problems caused by life. Even, or especially, in universities. Still, for most of us writing is also pleasure.